or: Why do French Caribbean Distillers Make Rum from Cane Juice? The thing about a monoculture is that you’re vulnerable to a host of externalities upon which you have no control. In the case of the French Caribbean, sugar monoculture worked just fine as long as the sugar was cheap and the bulk of the benefits went to metropolitan France. This arrangement also worked out well for the sugar plantation owners for quite a while, but the continual wars between England and France made it quite difficult at times. The British first attacked Martinique in 1693, but failed. The second try worked, however, and in 1762 Martinique was theirs. In 1763, a treaty was signed ending the Seven Years’ War, and in a move that underscores the importance of the sugar trade at that time, France traded all of Canada to get Martinique and Guadeloupe back. For all the trouble, the war did have a positive effect on the islands: during the British occupation of Martinique and Guadeloupe, the French benefitted from the Brits’ rum-making knowledge, and their rums improved (prior to this, even the French preferred rum from Jamaica and Barbados). In 1789, the French Revolution began, and it would soon have a dizzying array of effects on the French Caribbean. The revolutionary government in France abolished slavery in the French Territories in 1794, but before Martinique got word of abolition, the British occupied Martinique and slavery was maintained. This arrangement was welcomed by the colonial planters who stood to gain nothing from the revolution, and in 1794, the counter-revolutionary governors of Martinique, Saint Domingue, and Guadeloupe signed the Whitehall Accord, officially ceding power to the British. On Guadeloupe, things were much more complicated. Per the revolutionary government in France, Guadeloupe’s governor abolished slavery, only to have it reinstituted by Napoleon in 1802 after years of armed conflict among various factions on the island. During the Napoleonic Wars, the British blockade prevented sugar from reaching France, and by 1806, sugar had disappeared from French shelves. The lack of cane sugar prompted Napoleon to seek alternative sweeteners, and in 1811, he received two loaves of white sugar made from beets. The inventor of the process was Jean-Baptiste Quéruel, but he apparently had help from Spanish prisoners of war who had familiarity with the sugar making process. In any event, it was a huge turning point and so impressed was Napoleon that he decreed 32,000 hectares (79k acres) of beets should be planted in France and promised government assistance to establish beet sugar factories. Confident in France’s newfound sugar source, Napoleon banned imports of sugar from both the East and West Indies in 1813. By 1815, the beets had been planted, and 300 small sugar factories were constructed in France. The process to make crystalline sugar from beets was four or five times as expensive as making cane sugar, but government subsidies fixed that issue. In terms of production, beets differed from cane in that they could be processed asynchronously from their harvest, which enabled farmers to grow beets farther from processing facilities. Ironically, it was the success of central processing in beet sugar that led to the modernization of Martinique’s sugar industry. Fittingly, it was done at the behest of Derosne et Cail—the French manufacturer of equipment for the beet sugar industry. The company installed its first factory for cane sugar on Reunion in 1838, but the success did not translate to Martinique until Derosne et Cail began including on-site installation and commissioning assistance. Furthermore, the company located a number of trained mechanics in the islands to ensure the continued successful operation of the new equipment. On February 8, 1843 a massive earthquake estimated to have been 8.5 in magnitude hit the eastern Caribbean. Guadeloupe’s Pointe-a-Pitre was leveled—all masonry buildings were destroyed. The death toll estimates range from 1,500 to 4,000 people. The French saw little use in rebuilding the old sugar mills and pump houses, so they were replaced with modern sugar centrals. Equipment arrived in the second half of 1843, and the first began operating in 1844. Construction of new central sugar factories coincided with other modernization steps such as replacing mules with steam engines to power cane crushers, and using plows to till the soil rather than slaves with hoes. Centralization was easier to achieve on Guadeloupe than Martinique, as the bulk of Guadeloupe’s holdings were owned by French investors rather than colonial planter families. In 1845, Martinique’s first two sugar centrals were commissioned. In that same year, Louisiana Creole engineer Norbert Rillieux commercialized the first vacuum sugar pan (multiple effect evaporator) which automated the skilled position of the sugar skimmer and increased sugar yields dramatically. By 1847, Martinique had four sugar centrals. On May 22, 1848, slavery was finally abolished for good in the French islands. As a result of manumission, the number of slaves on Martinique at the time of emancipation had dropped to 74,100. With the advent of emancipation, Martinique’s planters attempted to address the labor issue from two fronts: mechanization of sugar production, and importation of indentured laborers from India, Africa, and China. Thus the further creolization of Martinique continued. Meanwhile, larger, more advanced sugar centrals eventually put the smaller mills out of business, and their lands were bought by the surviving planters on Martinique (the Békés) and French investors on Guadeloupe. By 1850, 20% of the world’s sugar supply came from beets. Thanks to government subsidies, prices were kept competitive with cane sugar, and eventually supply caught up with demand. Sugar was no longer a luxury item for the bourgeoisie, and the entire world developed a sweet tooth. The 1850s brought another challenge to France in the form of a powdery mildew called Oidium. The mildew attacked grape vines leading to the meekest harvest in six decades. As a result, Napoleon III suspended the import tariff on French Caribbean rum, and the French drank one million gallons of it between 1854 and 1857 (much was actually sent to French troops in the Crimea). In the 1860s, with the Oidium epidemic over, rum imports went back to about 200,000 gallons per year. 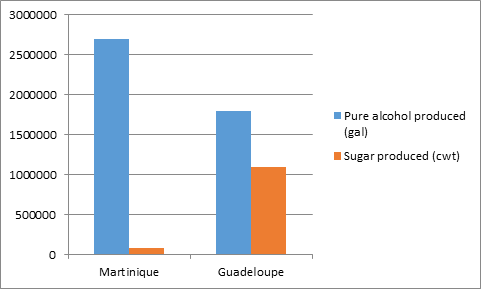 In 1883, 50% of sugar came from central factories on Martinique, 80% on Guadeloupe. By 1886, a full 95% of sugar came from central factories on Guadeloupe. Over time, nearly 1000 sugar mills were replaced by just twenty on Guadeloupe and seventeen on Martinique. Mechanization was absolutely imperative as of 1885, as beet sugar production officially surpassed cane sugar on the world market. Between 1872 and 1892, the phylloxera epidemic crippled the French wine and brandy industries. With limited alcohol available from continental producers, the French islands slaked the massive thirst with rum. The French imported 6.3 million gallons of spirits in in 1896 alone—most of which was colonial rum from Martinique (4.5 million gallons). 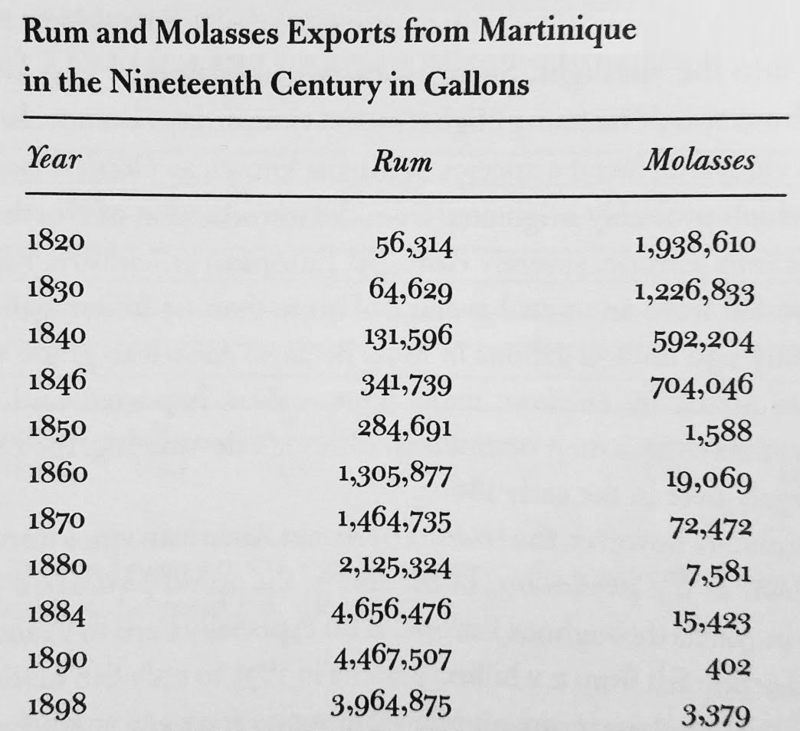 The relationship between rum and molasses highlights rum’s value to Martinique in the last forty years of the 19th century. With Martinique embracing new technology, distillers in Saint Pierre began using continuous stills that could produce ten times more rum per day than the old Père Labat style pot stills (continuous distillation would become ever more important as the islands’ distillers moved to the more perishable feedstock of fresh cane juice). By the 1890s, these large urban distilleries were importing massive quantities of molasses from Guadeloupe, French Guiana, Saint Kitt’s and Demerara to feed their fermenters. From 1899 to 1901, Martinique exported an average of 4 million gallons of rum per year. Just as Martinique’s rum industry was hitting its stride, tragedy struck. On May 8, 1902, Mont Pelée erupted, destroying the rum capitol of Saint Pierre, killing 30,000 and leveling dozens of distilleries. Overnight, Martinique’s rum production capabilities were cut in half. Many Martiniquan planters saw opportunity in Saint Pierre’s demise, and upgraded their smaller plantation distilleries to make more and higher quality rhum agricole. It was fifteen years before a distillery was rebuilt in Saint Pierre by the lone surviving member of the DePaz family, who was luckily off-island when the volcano erupted. It remains the only distillery in Saint Pierre, and one of just two on the northwest coast (Neisson is about five miles to the south in Carbet). In 1914, another tragic series of events negatively affected the production of wine and brandy in France, but this time the cause was not a garden pest or natural disaster; it was war. French soldiers needed spirituous fortification, and the army needed alcohol for explosives, so Martinique and Guadeloupe’s rum making abilities again came into sharp focus. The number of distilleries on Martinique increased from 86 to 96 during WWI, during which time they collectively exported over 30 million gallons of rum, most of which was agricole. Once the hostilities ceased, the increased production levels persisted and soon the distillers were victims of their own efficiency. Oversupply pushed rum prices down, and in 1922, the French government implemented a quota system to try and bring rum production levels in line with continental demand. France would allow 4.2 million gallons into the country, half of which could come from Martinique. 1920-1922 also saw the global price of sugar plummet, but the rum quota was increased over time, and by 1939, Martinique’s distillery count reached 150. With rum prices remaining depressed, commercial banana farming and sugar production took on increased importance. Between 1933 and 1937, rum represented just 31% of Martinique’s total exports, down from 84% in 1918. By the late 1930s, rum had nevertheless cemented its place in French drinking culture, representing nearly 25% of all spirits consumed in the country. WWII gave French colonial rum makers another chance at increased production, and after the war rum prices rebounded. In 1946, Martinique and Guadeloupe became Overseas Departments, making them part of France rather than being mere satellites of the metropole. In 1949, rum was back up to 50% of Martinique’s exports. The French rum quotas proved an insurmountable obstacle for small rum producers, and thus only the large distilleries like agricole producer Saint James could survive with such constraints. In 1970, rhum agricole finally overtook molasses-based rum in France, and in the 1980s, Martinique all but abandoned sugar making. Nearly every cane grown on the island was now destined to become rhum agricole. Guadeloupe, however, continued to produce large quantities of both sugar and rum. In 1975, Martinique recognized the unique importance of rhum agricole and applied for AOC status. By 1982, just eleven distilleries remained on Martinique—down 80% over thirty years. In 1989, French rum quotas were fixed at 5.4 million gallons of pure alcohol, of which Martinique could supply 44%, and Guadeloupe 33%. Production of rhum agricole was now a full five times higher than rhum industriel. France finally granted Martinique its AOC in 1996, officially giving the island’s most famous export a protected designation of origin throughout the EU. In 2007, the French rum import quota was set at 108,000 hectoliters of pure alcohol (about 5.7 million gallons of 50% rum) of which Martinique was allotted 33,000. In 2009, Martinique produced 74,537 hectoliters of pure alcohol, leaving 56% for local consumption and export to markets such as North America. Today there are seven distilleries on Martinique, six on Guadeloupe, and three on Marie Galante. Options for rhum agricole in the United States are slowly increasing though two primary importers: Spiribam (owned by GBH) and Caribbean Spirits, but the 750 ml bottle size requirement in the U.S. continues to be a barrier to entry for small producers. In Canada, rhum agricole’s elevated levels of ethyl carbamate are enough to scare Health Canada into blocking its sale. Through historical analysis it’s clear that many factors led to the rise of rhum agricole. The explanation of beet sugar overtaking cane sugar is important but inadequate when we see that while beet sugar was the dominant global sugar by 1860, it was overtaken by cane again in 1930. The same can be said of the Mont Pelee eruption, as 50% of the Martinique’s distilleries were unaffected. Similarly, it could be argued that French trade policy has had at least an equal effect on the industry. Finally, we must consider that rhum agricole didn’t overtake traditional rum in France until 1970, more than a hundred years after beet sugar rose to prominence. The commercialization of beet sugar, war, the abolition of slavery, natural disasters, technological advances in sugar and rum making, tariffs and tax exemptions all played a role in the transformation of the rum industry. Thus it must be said that the rise of rhum agricole can only be fully understood by examining the totality of factors present throughout the four hundred year history of the French Caribbean. To see all of these events arranged on a timeline, click here. Wonderful piece, lots of things I didn’t know here, well researched and documents.